Madeleines come in a palette of flavors, ranging from traditional lemon zest to orange-flower water, familiar vanilla, fashionable green tea, and, my favorite, honey. I have even come across savory herb or cheese versions. The sign of a fine madeleine is a little hump, created by leaving the batter to chill and stiffen for at least two hours, and by baking in a hot oven. The batter has a tendency to stick to the traditional shell-shaped metal molds, so they should be buttered twice. The cakes also turn out fine in nonstick silicone molds, but they will never color to a crisp golden brown. For a Proustian moment, savor madeleines as he did with a cup of tisane. The perfect pumpkin pie. rich, simple, delicious, that’s how I would characterize the nearly two-hundred year old recipe of Lydia Maria Child. 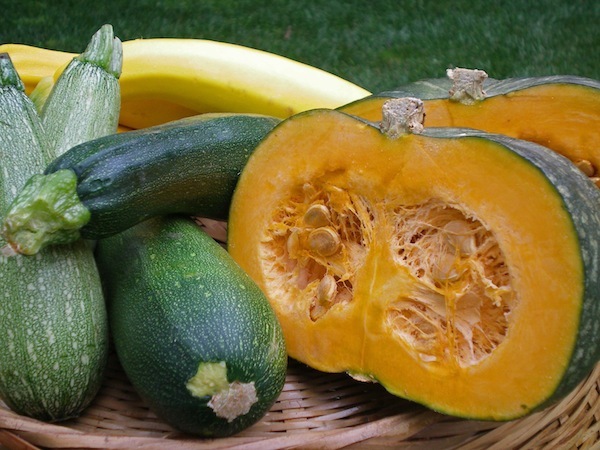 Despite the recipe title, Mrs. Child focuses on pumpkin, on the presumption that other common winter varieties of squash such as acorn, butternut, and turban behave the same way in the kitchen. So make this versatile pie all year around! 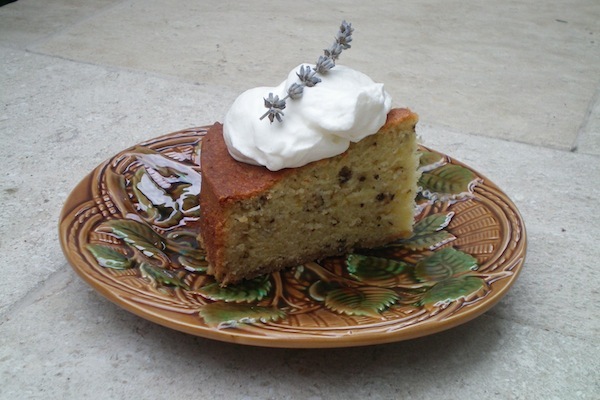 At New Oak Ranch, Karen Evenden makes this cake with Ojai pixie tangerines, walnuts, lavender, and olives (for oil) all grown on the property. When tangerines are out of season, oranges can take their place. This impressive cake has a splendid crisp golden crust. It serves a crowd and keeps very well. 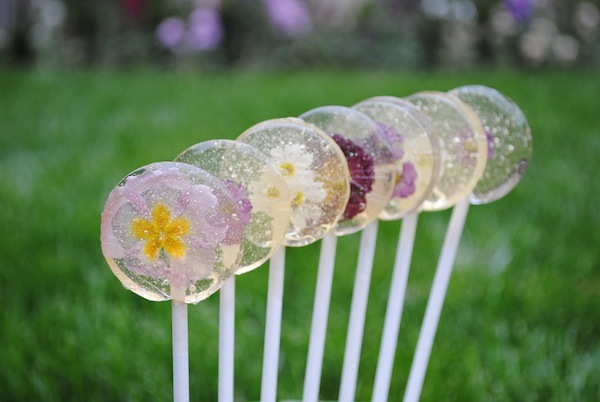 Flowered lollipops on a stick, embedded in rose-flavored sugar are easy to make. Any pretty flattish flower such as a primrose or a blossom of lilac or lily of the valley will do well. Lollipop molds are available at kitchen equipment stores, or on the internet. A thick wooden toothpick can be substituted for the lollipop stick. In the Roussillon region of France, tapas can spill over from appetizer to dessert in a series of little sweet offerings at the end of a meal. One favorite is clafoutis, a batter pudding made in little dishes with seasonal fruits such as cherries, apricots, or plums, with apples in winter. My favorite is juicy red berries, both sweet and tart. I aim for a mixture of raspberries and strawberries, with a few blackberries or blueberries added for contrast of color. 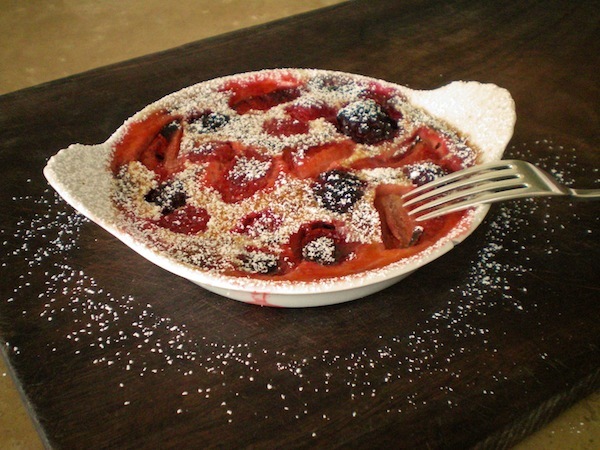 Best served hot from the oven, clafoutis can be prepared ahead and baked at the last minute. A sprinkling of sweet wine on the hot pudding adds an appealing kick, but orange juice can be substituted. Sweet Banyuls red wine, or white Rivesaltes are Roussillon specialties, but Port is also delicious.